Dairy farming in India is an ‘all season’ business. Efficient management of a dairy farm is the key to success. In India cow farming and buffalo farming are the backbone of dairy industry. Here is the complete guide to start and manage a cattle farming business for dairy purpose. Dairy form of cattle farming is a major, lucrative business primarily because a dairy farm is an ‘all season’ business. Irrespective of the season the demand for milk is either constant or increases. There has never been a decrease in the demand for milk and milk products in India. Dairy farming has been an age-old business in India passed down from generation to generation. During the late 20th century, this tradition saw a decline. However, thanks to the advancements made in science and technology, a huge progress has been made. The contribution made by Amul in the form of ‘White Revolution’ played a very important role in transforming the dairy industry in India from its stagnation level to a world leader. Cows farms and buffalo farms are the foundation of the dairy industry. Breeds of buffaloes like Jaffarbadi, Mehsani and Murrah are the high breeding ones while Red Sindhi, Gir, Rathi and Sahiwal are the top milk breeders from India. The above list is a basic list that can go endless. Commercial dairy farming is very different from the traditional farming as it has a lot of technological requirements and challenges. This is the first requirement for a successful cattle farming. The animals must be healthy, with good weight and build. While purchasing cattle the eyes, nose, udders, mobility, coat and other features must be carefully observed. Eyes: Eyes must be clear and bright with no discharge. They must not appear bloodshot or crusty as they are indicative of infections. Nose: A moist muzzle with constant licking is favorable. Breathing: The breathing of the cows must be normal and not laborious or irregular. Wheezing during breathing with or without discharge suggests infection. Coat: The coat must be clean and glossy with no signs of ticks and lice. In case of ticks, the coat would appear matted. Udder: Udders must be healthy with prominent milk veins sitting forward. They must not be sagging or meaty in appearance. In addition the udders must not show too much sideways movement when walking. Attitude: Animals are generally alert and curious with a self-contented, calm look. They move about in herd and are together. Animals that stand apart or seem disinterested in the happenings around are signs of unhealthiness. Age: The age of the animal must be checked by looking at the dentition although this is not exactly a sign of good health. You must find out the age of the cattle to setting up and manage a dairy farm efficiently. Mobility: Animals must rise easily from sitting position without any limps or difficulty. Sitting in hunched position, limping are signs of abnormalities or deformities. History: It is important to look at the history of the animal including details like previous calvings, milk yield, hypocalcemia, etc. Shelters for animals are an important factor for optimizing the yield. Stress and weather changes cause a decline in productivity. The housing facilities must be clean, spacious and must allow flow of natural air and sunlight. The cattle shed must have a floor space of 10 feet by 5.5 feet per animal with a 1.5% slope towards the drain. The floor must be made of rough concrete material. The sheds must be at least 10 feet high. They may be constructed using bricks, RCC or can be thatched. Only the western side of the shed must be walled while the other three sides must be left open. However, the open sides must be covered with gunny cloth during winter to protect the animals from cold. There should also be a provision for sprinkling water on the animals every half hour during summer. This reduces heat stress to a great extent. The eastern side of the shed is open outdoors for free roaming space. The roaming area is covered with trees providing shade. Neem and mango trees are the most preferred trees for shade in the roaming area. The mangers are located on the western side of the shed. They are built 1 foot above the floor level; they are 2 feet wide and 1.5 feet deep. Drinking water must be kept beside the manger. The mangers are generally constructed along with the shed construction. At some places, they may provide a separate box as mangers. Several of the above symptoms occurring together are signs of heat stress. As said before the sheds must have adequate air circulation and sprinklers to spray water. Water evaporation from the body leads to cooling of the body. Thus the body temperature decreases and the animals are comfortable. Therefore, food energy is utilized for milk production and not in other bodily functions like blood pumping, breathing, panting, etc. Food is one of the most basic aspects of living beings for they perish owing to lack of food. Cattle feeding cost a total of 70% of the milk production. Cattle are fed with fodder, grains, brans, green fodder, straw, oil cakes and other such cattle feed. The feed for a normal adult animal is 15-20 Kg of green fodder and 6 Kg of dry fodder per day. The green fodder is harvested during the flowering stage and the surplus fodder is preserved for hay. 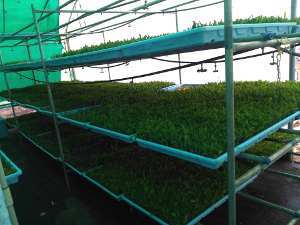 Preserved fodder is used during summers when fresh green fodder is unavailable. It is necessary to strike a balance between the various nutrient requirements for optimal milk production. If the animals are given an exclusive dry fodder diet, then they must be given Urea Molasses Mineral Block as the supplement. They are also fed with bypass protein feed or compound cattle feed for an efficient production of milk and better body maintenance. In case the feed needs changing, the change must take place gradually. To increase digestibility and reduce wastage, fodder is chaffed and they are fed 3-4 times a day in equal intervals. This rationing is an attempt at reducing wastage and increasing digestibility. Water is needed for digestion, nutrient distribution, excretion, maintenance of body temperature and of course, milk production. Every liter of milk produced needs an additional 2.5 liters of water since milk contains 85% of water. Hence, a normal healthy adult animal requires 75 to 80 liters of water per day usually. This can increase to 100 liters during summers. They must have regular access to clean drinking water. Crossbred buffaloes and cows are given a bath twice a day during summer to maintain their body temperature. Provide enough space for standing and sitting comfortably. 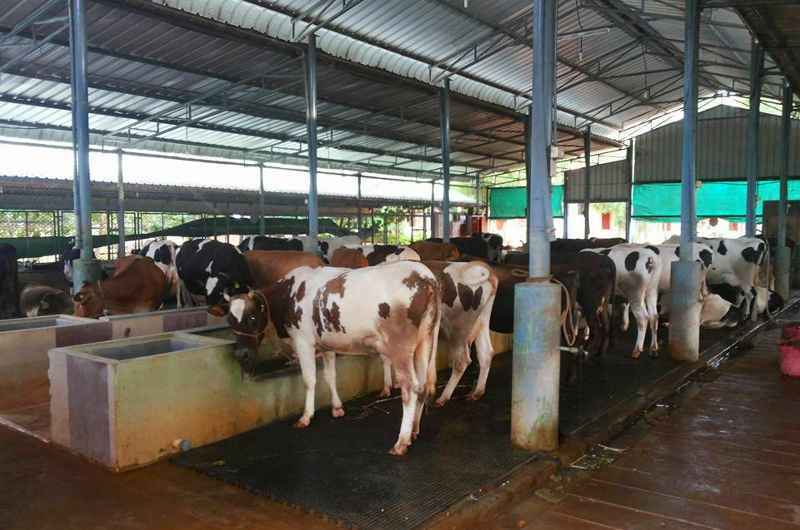 They must be given adequate amounts of ration to ensure timely milk production in adequate amounts and also to reduce the possibility of milk fever, ketosis, etc. at the time of calving. During pregnancy, special attention must be paid to water requirements; there should be round the clock supply of clean, drinking water. During the last trimester of pregnancy, the animals must not be taken far away for grazing and uneven paths for grazing must be avoided. Lactating animals must be dried within 15 days after the 7th gestation month. From the 6th or 7th month of pregnancy, the cow’s body, back and udders must be massaged- this is especially in case of first or second pregnancy (heifer cows). Heifer cows are tied along with the milking animals from the 6th or 7th month of pregnancy. The pregnant animals are tied separately in a clean and dry area with ample sunlight about 4-5 days before calving. Paddy straw is the bedding material for animals and they are spread on the ground. During the last 2 days before calving the animals are kept under observation. During calving, animals undergo a lot of stress. Hence they would have a low appetite and tend to eat far lesser than what their body needs. Since the appetite is low the cows and buffaloes are given boiled rice, wheat bran, wheat mixed with edible oil, jaggery, boiled millet, rice gruel, ginger, black cumin, etc. The food must be light, warm, palpable and mildly laxative. This type of diet must be given for 2-3 days after calving and it helps in early expulsion of placenta. It advisable to give the animals fresh green fodder and water. While the ration food must be warm, the water must not be boiled or hot. It should be fresh water. 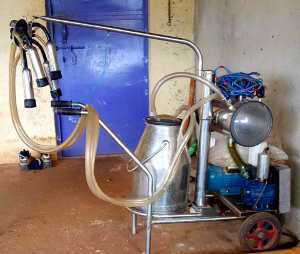 Clean drinking water is very necessary for milking cows else they are likely to develop diseases. The life of a calf is divided into 2 parts as the first 24 hours after birth and the rest of the period. Allow the mother to lick the calf clean as it stimulates circulation and helps the calf stand up and walk. Give the calf 2 litres of colostrum (first milk produced) within the first 2 hours of birth and then again 1-2 liters depending on weight of the calf within the next 10 hours. The calves must be de-wormed every month upto 6 months of age once the calf is about 2 weeks old. Vaccination must be done at the age of 3 months. Calves must be provided with starters for good growth and early maturity from the 2nd week of birth. Colostrum is an important feed for newborn milk especially is contains high amounts of proteins and antibodies which help build immunity. It helps the calf ward off infections. Most calves do not nurse adequate amount of colostrum from their mothers therefore hand feeding is necessary. This ensures that the calf has the required amount of colostrum. However, feeding colostrum after the first 24 hours has passed would not help in warding off infections or building immunity. Hypocalcaemia Low level of calcium in blood. Occurs within 72 hours of calving. Head bobbing, ear twitching and fine tremors near loins in initial stages. Complete milking in first 48 hours would precipitate milk fever. Do not feed excess calcium supplements in the later stages of pregnancy. Hypomagnesaemia Occurs due to low level of magnesium in blood. 50 grams of magnesium oxide per day is recommended for susceptible animals. Veterinarian must be contacted in case of severity in symptoms. Ketosis When the milk production or energy demand is higher than the energy intake, it causes ketosis. Marked by a covering of mucous around the dung. Constant licking of manger, body, etc. Mastitis if occurs must be managed properly else it would lead to ketosis. Excess consumption of sugar beet and turnips. Deficiency of Copper and phosphorous. Marked drop in milk production. Place the mass on a clean surface, call a veterinarian and protect the mass from flies. Check the vulvar area for sticthes at the time of buying the cow. Owing to increased blood flow to the udders, there is excess fluid accumulation in the udder. Obesity, lack of exercise are other causes. Should not be confused with mastitis. The digestive system of cattle is a complex one involving four different chambers, a host of microbes, etc. Hence any change in feeding pattern would lead to imbalance in the microbes and hence different diseases like bloating, laminitis and rumen acidosis. While home remedies can take care of bloating, laminitis and acidosis need a veterinary care. Teat dipping or spraying the teats after milking. This practice must be continued even after drying. Milk the cattle with chronic mastitis at the end. Do not let the animals sit for at least half hour after milking. Theileriosis 3 months and above Once a lifetime dose needed only for exotic and crossbreeds. Anthrax 4 months and above Annually in case of endemic areas. Besides the raw milk there is a huge market of milk products like powdered milk, ghee, cheese etc. Even the waste in dairy farming is valuable and has good market demand. The ‘gobar’ or cow dung is the raw meterial of organic compost or vermicompost. If you’re using ‘desi cow’ or Indian cow breed in your cow farm then the cow urine is a valuable resource to make ‘panchagavya’ or natural insecticide in organic farming. Looking after and maintaining good animal health is the gateway to successful dairy farming in India. Maintenance of animal health, looking after its breeding and nutrition supplemented with proper information system is beneficial. The government has created Information Network for Animal Productivity and Health (INAPH) for the benefit of farmers. It records the on-field cattle activities, schedules and nutrition. This channel in turn helps the farmer for regularization of his or her dairy farming business.